A composer who contracted HIV and hepatitis C through an NHS blood transfusion has won a High Court challenge over compensation levels. Andrew March, 36, had criticised the government's refusal to match higher payouts in the Republic of Ireland. Mr Justice Holman ruled that the way the UK government had reached its decision was flawed but said it was not his role to rule on the amount paid. He said campaigners should therefore not now have "false optimism". After the hearing Mr March, who was infected via a transfusion when he was nine, said: "Having the judgment go in our favour gives us no pleasure at all. "We hope that the government will now consider the whole issue of compensating those so tragically affected by the contaminated blood disaster, instead of making token, derisory, ex-gratia payments." Earlier, in his ruling, the judge had commended Mr March for his "tenacity" in bringing the case. Lord Morris of Manchester, the Labour peer who is president of the Haemophilia Society, said: "This is an historic decision, most warmly welcomed by the haemophilia community. Nearly 5,000 people were exposed to hepatitis C before the heat treating of blood products began in the mid 1980s to kill viruses. They were mainly haemophiliacs, who were given a product to help their blood clot. Of these, more than 1,200 were also infected with HIV. Almost 2,000 of those people have since died as a result. A privately-funded independent inquiry last year, led by Lord Archer of Sandwell, called for an overhaul of payouts for those who contracted the diseases through infected blood in the 1970s and 1980s. But ministers refused, promising only those with HIV £12,800 per year. Those with hepatitis C are paid separately. 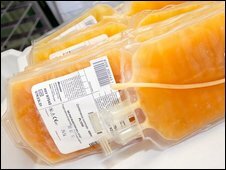 The government has refused to assess compensation on the same basis as the Republic of Ireland as it considers that the Irish blood transfusion service was found to be at fault, which was not the case in the UK. Money for those who contracted hepatitis C, which works through a series of lump sum payments, is not due to be reviewed by the government until 2014. A spokesman for the Department of Health said it would consider its position following the judicial review. Justice Holman said: "I wish to make it absolutely clear that the allocation of resources is entirely a matter for the government." But he added it had been faced with a specific recommendation, which it had rejected, of comparability or equivalence with Ireland where "very much higher" payments were made to patients and their dependents. And he said they had not merely repeated that they could not afford it, but given a reason which he felt contained an error and which did not withstand scrutiny - that they continued to regard the Irish system as based on fault rather than on compensation. He added: "The campaign may now return to the political arena, but no-one should leave this court-room with false optimism." The judge refused permission to appeal, although leave to appeal can be sought directly from the Court of Appeal.